Remote Water Quality Control in the Palm of your Hand! We Offer The Best in Water Quality Control Technology! Chemical automation is recognized by health officials and industry leaders as the safest, most effective method of maintaining precise, healthy water balance. Water chemistry automation has revolutionized commercial swimming pools. Today, many of our clients are relying on this amazing technology to provide safe, sanitary pools for their guests. 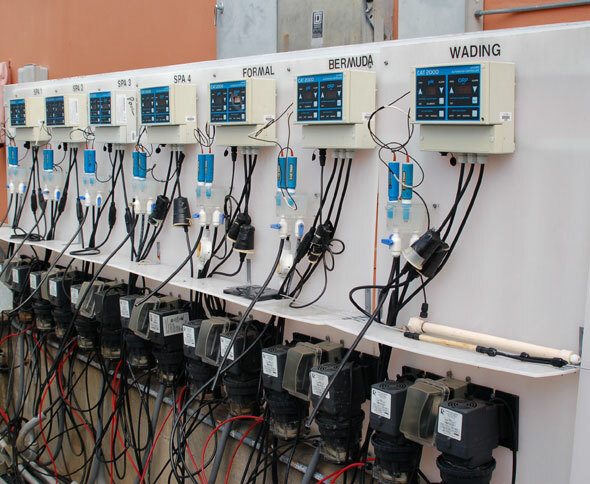 Spies Pool invites you to join thousands of commercial pools, spas, water parks and water treatment facilities who rely on CAT Controllers for meticulous water quality management. Two of our favorite, premium water quality controllers are the CAT 2000 and CAT 4000. This technically advanced water management controller continuously monitors pH and sanitizer levels. It automatically implements pH control using either CO2, muriatic or sulfuric acid and sanitizer levels using either liquid chlorine, Calcium HypoChlorite, Bromine, or Salt. This method automatically implements chemical feeding for pin point accuracy and picture perfect water quality at all times. Programmable microprocessor-based design technology for unparalleled accuracy, adaptability, reliability and safety. Advanced control of over all setting, feed and alarm parameters ensures compatibility with virtually any application. Waterproof touch-screen front panel provides fill access to all functions. No internal adjustments required. Factory and operator settings are permanently stores in internal non-volatile memory. No battery backup required. Simple installation, setup and operation. Fully compatible with existing sanitation systems and chemical feeders. This CAT 4000, water chemistry controller provides impeccable water quality around-the-clock. Like the 2000, it monitors and feeds your pool exactly the chemicals it needs, at exactly the correct time with all the same features. The 4000 Controller is web-based so you can begin monitoring your water quality. By using your personal POOLCOMM website, you can view water quality data, print charts and graphs, customize your settings, and receive alarm notifications via email, pager, text message, or cell phone. iPhone, Android or web-enabled mobile devices can all be used with this controller feature. Wireless link to the poolcomm site with extensive North American coverage and 24/7 monitoring. Incredibly simple to install and operate via simple menus and a bright alphanumeric display. Compatible with existing chemical feed equipment so initial investment is minimized. Visit our Resources page under helpful links to find PoolComm link to view a demo of this technology. Spies is the largest installer of CAT Controllers in the World. Spies has been a factory authorized CAT installer and warranty center for over 15 years. Spies has 600 plus units in the field currently operating. Spies keeps 5-10 units in stock at all times along with the probes and flow cells (with flow switches). The CAT 2000 has a 5 year manufacturer warranty/probes have a 2 year warranty. Spies has a free CAT 2000 loaner program if repairs are ever needed on your units. Spies has 6 service technicians covering Central Florida with a complete CAT 2000 unit, probes, and flow cells (with flow switches) on each truck. Spies Pool does not desert you when you purchase the CAT Controllers. They bring you supportive in-field training and updates in the new technology.